Brian Niccol was a hit as Taco Bell's CEO. His job at Chipotle won't be as easy. Chipotle tapped Niccol earlier this week to solve its mountain of problems. The chain was once the gold standard in fast-casual dining because of its higher-quality meats and veggies, but it has been plagued by food safety fears since a 2015 E. coli outbreak. And customers have found other reasons to stop coming back. Analysts say lines are long, stores have been messy, and new offerings such as chorizo and queso have been flops. "The experience is lacking, and there's nothing new or noteworthy on the menu," said R.J. Hottovy, an analyst for Morningstar. Chipotle (CMG) was a Wall Street darling because its $12 burritos offered higher profit margins than cheaper fast food, but the stock lost two-thirds of its value over the past three years as sales stalled and margins shrank. Founder Steve Ells gave up his role as CEO last year, and a top activist investor pressed for changes. Although Chipotle has positioned itself as a healthier alternative to chains like Taco Bell, analysts believe Niccol is a creative leader who can overhaul Chipotle's image and drive growth. Wall Street agreed, sending the stock up 15% on Wednesday. Investors loved the move because Niccol helped transform Taco Bell into one of the most innovative fast-food names in the country during his tenure as chief marketing officer and president from 2011 to 2015, and as CEO since then. When Niccol came to Taco Bell, it was reeling from a lawsuit alleging stores weren't using real beef in their tacos. "Our reputation's been falsely tarnished," the company's president said at the time. Although the lawsuit was eventually dismissed, Taco Bell attributed sluggish sales that year to damaged perceptions of the food. But Niccol used eye-catching ads to make Taco Bell more "youthful and relevant," Morgan Stanley's John Glass wrote in a report. His first order: changing the slogan from "Think outside the bun" to "Live más." Niccol was Taco Bell's marketing ace, launching an online petition to push for a taco emoji in 2015 and building expensive ad campaigns — "Web of Fries" most recently — around new food. Taco Bell posted an average of 4% same-store sales growth during his run as CEO, a signal customers were happy with the food and coming back for more. Niccol also launched breakfast at Taco Bell and introduced successful items like Doritos Locos tacos and nacho fries. He pursued a $1 value menu strategy and limited-time offerings to create buzz around products. Taco Bell experimented with cantinas in major cities that offered alcohol. and it tinkered with restaurant design. The challenge now will be taking that playbook to Chipotle. Russell Walker, a marketing professor at Northwestern University's Kellogg School of Management, laid out the challenges for Niccol: He needs to figure out how to get people back in, persuade them to spend on a main dish and tack on a side, and leave them satisfied enough to return. Adding breakfast at Chipotle or keeping it open late at night would give customers new times of day to come in. Expanding value choices could lure new customers who have preferred cheaper rivals. "Simplicity has been the core of Chipotle," Hottovy said. "They need something that gets people talking about the brand again." Hottovy suggested adding nachos or new drinks, including booze, and tailoring an advertising blitz on digital channels and national TV around the product. Chipotle is testing frozen margaritas in New York and Austin, Texas. Strengthening mobile ordering could also shorten wait times, said BTIG analyst Peter Saleh. "No one thinks of using their mobile app to order Chipotle," Saleh said. Delivery is another tool Niccol could use to boost sales. 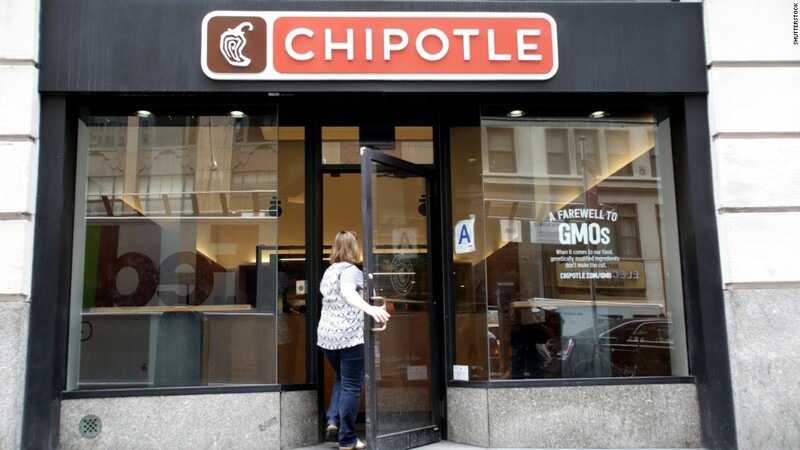 Chipotle has fallen behind its rivals as they expand delivery. Days before Niccol took the Chipotle gig, Taco bell parent company Yum Brands (YUM) announced it was taking a $200 million stake in Grubhub. Day-to-day operations will probably be a priority as well. Extensive food safety precautions have disrupted work flow at restaurants and led to higher employee turnover levels, Hottovy said. Northwestern's Walker said the first thing he would do would be to get a handle on labor unrest. Nearly 10,000 workers sued Chipotle in 2016 for unpaid wages, and employees have complained of "shady practices." Niccol "has to be able to convince his staff that he's behind them" and then devise a plan to retrain workers.